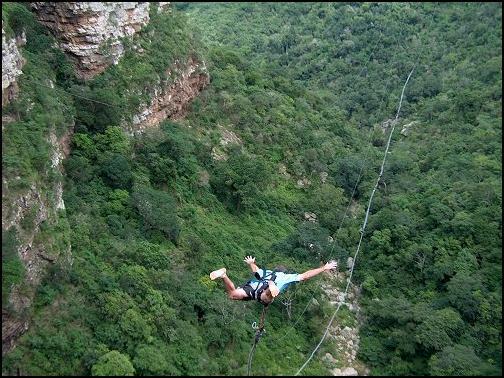 Bungee jumping requires bravery. After all, you are jumping head first off of a bridge and coming within 30 feet of the ground before being shot back up again. This continues several times until you lose momentum and stop. 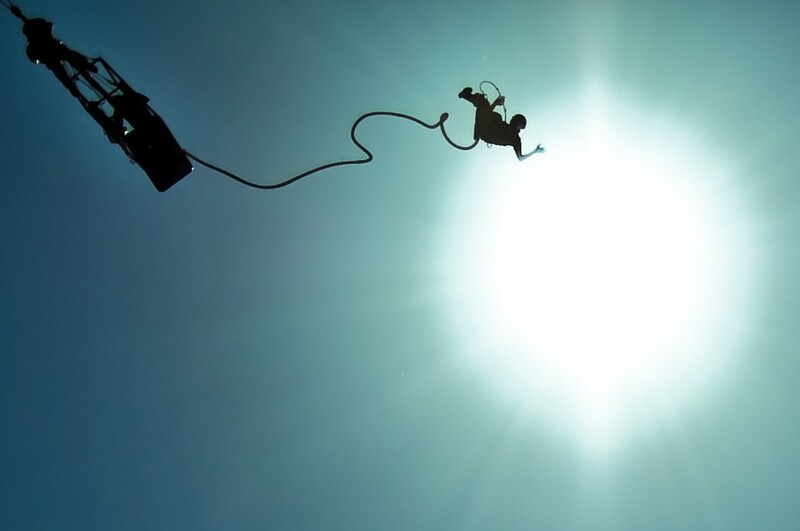 Most adrenaline junkies would agree, bungee jumping is scarier (and more fun) than its cousin, skydiving. Either way, it’s an experience you don’t want to miss. To begin, you have to find a bridge which is high enough off of the ground. If the bridge is too low, well… you know what will happen. Before the jumper makes the leap, a bungee cord is attached to his or her feet. This ensures that they will be secured. In the past, cords have been known to slip off of people’s feet so the bungee jumping industry had to introduce a back up device- a harness. The body harness goes around the body (waist) and serves as extra protection during free fall. It doesn’t cut off circulation and it is comfortable. 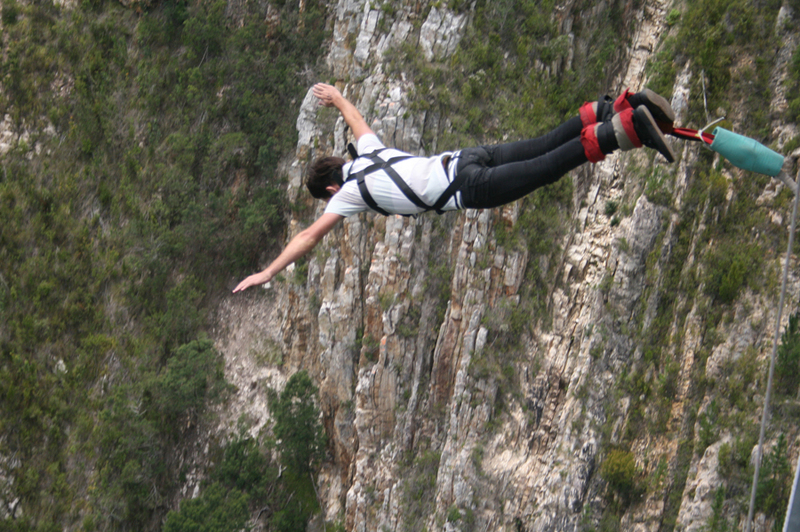 If you are thinking about bungee jumping, then this should give you some ease of mind before actually doing it. At this point, all you are hoping for is that everything is secure! After double checking everything, the jumper leaps off the bridge. Be sure to keep your arms spread and head high to avoid getting tangled in the line. If you forget to do this don’t worry- they are designed super safe and it’s hard to get hurt using them. As you are falling, the line isn’t going to hold you back. You are free falling. As soon as the rope fully extends the jumper gets launched back up. The process continues with each drop being less and less until finally, it stops. Then it’s up to you to find your way back up… just kidding. You have the option of climbing up the rope yourself or getting pulled up by an attendant. Located in Nepal, Ultimate Bungee offers some of the most breath taking scenery in the world. Get ready to take a 150-meter leap of faith over the Bhoti Kosi River. The gorge is huge and offers the best experience for thrill-seekers. As you are falling take a couple of seconds to take a look around you. You’ll witness a beautiful jungle which lines up against the Himalayas. Once you reach the bottom, you’ll come face to face with crystal clear water before being shot up again. If you are looking for the perfect mix of visuals and a rush, then Ultimate Bungee is perfect for you. This exotic bungee jumping spot is located in the far away land of New Zealand. As a matter of fact, it is the birth place of this adrenaline filled hobby. They have a beginner bridge which is about 45-meters high and offers a variety of jumping styles. You can even touch the water below if you choose to- or get completely doused by it. Maybe you would like some more options. If so, you can get a running start off of the ledge and try different tricks and flips on the way down. Don’t worry, the rope is designed to avoid getting tangled around your body. Below you can enjoy watching the people and places of Queenstown. Unfortunately, James Bond won’t be here for this one. However, the 007 Bungee Center does make jumping off of bridges look way cooler. How did they snag this epic name? When you visit this location, you have the option of adjusting your cord so that you can jump exactly the way James Bond did at the end of the move, Golden Eye. How cool is that? Depending on the amount of experience that you have, the organizer may allow you to try some tricks and get creative with it. This 220-meter drop will leave you shaking- but not defeated. First time jumpers, this place is for you! If you have never done this before chances are you are going to be terrified. Wouldn’t you love some ease of mind knowing that you are jumping off of one of the sturdiest bridges in the world? The Bloukrans Bridge is located in Cape Town and spans a massive 216 meters from the ground. It is the third highest bridge in the world and until tons of competition flooded the market, the most popular. Get ready for beautiful scenery centrally located over the Tsitsikamma region. By now you should probably be pretty familiar with the name AJ Hackett. What importance does he have? To begin, he trail blazed the path to what we know as bungee jumping today. Now he has locations all around the world and many of those being in exotic locations. The bungee jumping location in Macau, China is his newest venture and has become the most popular location on the planet. Not only does it offer a staggering 233-meter free fall but you also fall only a few meters away from the Macau Tower. Although you don’t ever get close enough to touch it, it is an experience like no other. Believe me when I say you won’t find anything else like this in the world. What is the point of excitement if you don’t involve a little risk, right? I mean, it doesn’t get much better than huge platforms, overwhelming heights, and strings that could snap at any moment (not really). There is no better feeling than staring down a bottomless pit knowing you are about to enter the mouth of the beast. It is the closest thing you can experience to flying without wings and it is the most fun you’ll ever have off of your own two feet. I promise you that bungee jumping will be the most fast paced, exhilarating 5-seconds of your entire life. Be brave fellow adrenaline junkies! This entry was posted in Africa, Air Sports, Asia, Bungee Jumping, New Zealand, Travel and tagged Bungee Jumping, China, Nepal, New Zealand, South Africa. Bookmark the permalink.